It is important to follow up with the embassy and gather as much information as possible about what steps need to be taken in order to resolve the case. It is good to ask as the officer as soon as the 221(g) letter is handed out about the nature of the 221(g) given and what next steps need to be taken to overcome it. This might lead the officer handing you out a questionnaire or a supporting documents submission form immediately rather than through mail that way saving some processing time. Inform your employer, client and the concerning manager/supervisor about your situation and that they may be contacted about your case as well as the interview questions (related to them) that were asked. This way are ready and do not give conflicting responses to the same question. If the consulate has given you a questionnaire complete it as soon as possible and return it. If any supporting documents are requested try to submit then within the first few days to reduce the processing time and to clear the 221(g) sooner. take longer than the average 60 days. It might be a good idea to have the attorney or legal firm who filed your visa to contact USCIS or department of state about the status of the case. Even though usually they get the same response with only some additional details about the nature of the case it might help as the response would be from a legal team in DOS. Also in cases where the case is waiting for additional information or documentation the legal team might be able to provide that to the processing agency. It might also be helpful if your employer can contact the consulate with a strong supporting letter highlighting the importance of your work and how badly the company needs you back in US. Some cases take longer than 6 months. In this case it becomes difficult as the usual generic responses do not provide much insight on what is causing the delay in the case. One of the methods to inquire about your case at this point is to have a congressman or senator of the district you work in contact the DOS about your case. The information on senators and congressman with their serving areas can be found in the links attached. Usually the easiest method to contact them is email them. The representatives also have office phone numbers and one of the secretaries can guide you further but usually they will still need to understand the case so an email can provide them the details. The representatives office will ask you to sign a waiver to find information for you. Also give them details of your case and how your inability to travel impacts your employer. Sometimes the representatives office takes a long time to respond in which case try calling them. Also once the representatives office picks up your case they will provide you with the status of your case at an official level. Request the representatives office for further details on your case and reason for delays. Another possible method of finding information is filing a request with Department of State or USCIS under the Freedom of Information Act asking them to provide consular notes on the case, that way actual reasons of 221(g) can be found and may be a way out can be found. This happens in very rare cases. But if your case has crossed one year and the inquiries from the legal team or the representatives office have not yielded much it is possible to file a petition against DOS for expediting your case and getting a conclusion. This is known as “Writ of Mandamus”. The writ needs to be filed in the state the applicant is employed by a licensed attorney. It might be a good idea to have your employer file it as it will have a higher likelihood of getting accepted by the judicial system. Once the judge accepts your case the DOS has 60 days to respond. Usually this will lead to expediting the case to resolve in 60 days. Not all cases will be accepted though so get legal advice before proceeding this route. Most of the EVC companies hesitate to file for Writ of Mandamus because it could bring them into spotlight and may even lead to investigations related to the case. In general after 1 year an EVC model applicant can also consider changing the employer and reapplying for the H1B. One of the most difficult things for the applicant when on 221(g) is the individual is stuck in limbo with little to no information on the resolution. If you are a student it might help to postpone your reporting semester and delay the semester you start if no assistant-ship or scholarships are involved but with jobs it is much more difficult situation. With the current economy jobs are difficult to find and retention is not easy either. Try to accommodate the employer as much as possible. This might involve using up your vacation and holidays. Some companies allow unpaid leave that way you can buy some time till the 221(g) comes to a conclusion. If possible support the employer remotely and convince them that you can manage your job remotely. Some companies have branches in your home country. It is possible work at the branch and maintain the job while you are waiting. I worked from two different cities while i was waiting for the visa in my home country. Some employers have Canadian branches and might prefer their employees to work from their. Usually Canadian work visa requires labor opinion but it is possible to get a GETS Canadian work visa for a short term (less than 6 months) assignment very easily without a labor opinion. This way one can work from Canada for a few months but keep in mind the processing of Canadian visa takes a few days (20 days in India). But there is not one solution that works for all. Some companies may prefer one method over another so be just be accommodating. Another thing to keep in mind is expiring H1B. If the H1B petition with a particular employer expires while the applicant is in 221(g) the consulate will not issue the H1B even after 221(g) is cleared until a new petition is filed for a renewal. Some employers can be hesitant of investing in a employee because of the existing 221(g) which means the employee is stuck in a circular argument (clear 221g we will file visa, file the visa we will clear 221g). So it might be helpful to appear for the interview a year before the expiry of H1B petition. I applied for my student visa on the 27th of July at the embassy in delhi, India. I was told by the officer that visa has been approved however I had not paid my Sevis fee to which the officer said I could pay after the interview online or next day so I paid the fee and submitted the documents the next day, I was told I would get the visa in 2-3 days but it’s been almost 3 weeks and I am supposed to start my studies on 24th August and was told last week my visa is under processing. Any ideas as to what I should do and whom to contact ? Any updates on your situation. If you have not been contacted yet email the consulate. I HAD MY INTERVIEW AT NEW DELHI ON 18 NOVEMBER AND MY INTERVIEW WENT SMOOTH BUT MY VISA OFFICER TOLD ME THAT HE HAD NO INFORMATION REGARDING MY SEVIS FEE AND TOLD ME THAT I HAVE NOT PAID MY SEVIS FEE , I SHOWED MY CONFIRMATION LETTER OF PAYMENT , HOWEVER HE TOOK MY PASSPORT AND REPLIED THAT HE WILL CHECK THIS FEE AGAIN AND IF HE IS GOING TO FIND THAT FEE IS UNPAID HE WILL REJECT MY VISA , ITS BEEN 3 DAYS AND COUNTING , MY STATUS IS ADMINISTRATIVE PROCESSING . HOW MUCH TIME IT WOULD TAKE TO VERIFY MY FEE ?, AM I UNDER ANY 221(G) OR ANY OTHER CASE ?.MY VISA OFFICER DID NOT HAND ME ANY SLIP. I HAVE TO START MY CLASSES ON 28 DECEMBER ? THIS THING IS KILLING ME .I HAVE SEEN MANY CASES WHERE ADMINISTRATIVE PROCESSING TOOK AROUND 60 DAYS ? ANY ADVICE FROM YOU GUYS ? Did you get your visa yet? My wife got the similar kind of response. Let me know. I was schedule for interview and i was a given a white letter saying i have been found enilligeable under section 221g and my case will be forward to NVC and later to USCIS and this will take about 6 months.I’m a Ghanaian and my wife is American citizen.What can we do to over come this situation? Hi, I had my visa interview at Kolkata consulate on 3rd December, 2015 and was handed over a 221(g) white form requesting for another document “Panel Phyisican Report”. However, the case number is missing in 221(g) and the hospitals won’t conduct the physician evaluation unless I have a case number. Could you please guide me how do I retrieve my case number? You advice is very much appreciated! I have attended for my H1b interview in April 2016 and I received 221g at New Delhi consulate and asked me to submit my USA Master transcripts and few college documents and college flight tickets ,internship agreements my pay stubs etc.. I have submitted them and then they asked me to attended the interview again and asked for my Employer tax returns for 2015 which were available since they have taken extension till August to file taxes.I then received another 221g and in which they want me to submit my employer tax returns and I have submitted the tax returns on August 2016 and I confirmed with embassy that they have received the tax documents but till now I dont see any update on mycase still it shows the old date in May 2016 and it been months and I dont see any reply from embassy or update on my case. What is my option at this point of time. 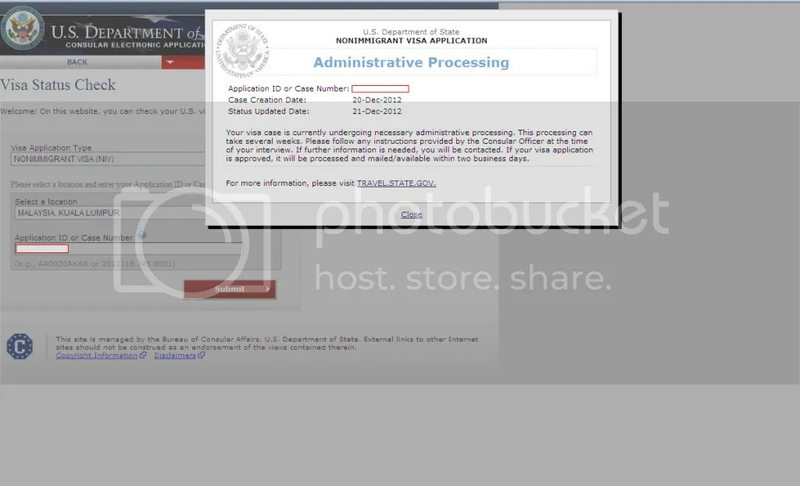 I have my student visa till 2019 but my sevis is terminated in December 2015 as I got my H1b is there any way that I can go back to USA on my present F1 visa or I should wait till i get my H1b cleared in administrative processing. Please advise and thanks in advance.. The US Consulate has my passport with them and they have issued a 221(g) without asking for further documents. Please let me know the process to back my passport ? Good day, I when to the embassy to in Jamaica for h2b but the petition is approved we were told to make our appointment at the embassy which we did but up until now we have not received the petition. It was four of us who when today to the embassy and all four of us get the pink paper except I didn’t not get back my passport And the consular stick this one that your visa application requires additional administrative processing what does this mean?? I am so confused and my colleagues own says that whenever they get the petition they should send it with there passport to Dhl . how do you know that recent cases are faster ? hello, I went for imigrant interview on 8th February in Ghana embassy and the consular asked for more documents which is my certificate. I dropped the at the us travel docs the same day.witin two weeks they updated the date of the case to 21st February. for two weeks now haven’t had any e-mail or message from the embassy.they are having all my original documents certs passport everything.can I mail them to no the status of my case? I had my K1 visa interview on March 27th, 2017 in Islamabad, Pakistan. Interview went well but at the end of the interview. CO handed me the 221(g) white slip with administration processing required. Its been more than a month. Only date update on the case was the date updated once on April 03rd, 2017 but the status is the same as before the interview “Ready”. No update since then, Not even showing Administrative Processing on CEAC website. Any Suggestion to find out whats going on with my case will be really helpful. Can petitioner or Employee withdraw the application while it is under administrative processing? My wife was waiting over 2 years under case 221g ( incomplete documents)with no request !? “DADDY ” in English , that’s all. Nothing can void this painful. I had my visa interview on Thursday November 2nd for a B1/B2 visa. I was given a form 221(g) and asked to provide proof of Sevis payment and my passport via DHL. I am not applying for a F or M visa, and do not intend to attend any educational program. I have not applied nor have I been accepted to any schools and therefor I haven’t paid Sevis. I do not know what to do at this point. What would you recommend I do? I and family attended H1b Visa stamping (2nd time) interview at Hyderabad in May, 2017 on 2nd employer B received 221g white paper. I submitted documents next day. Again in June got a call from Hydfpu, asked about job description. Since then no updates from Hyderabad consulate. I have my approved transfer H1b documents where my family doesn’t have. Even I took them for interview. is this the reason behind 221g white paper? “B” employer have only 5 employees. VO asked thrice regarding this during interview. Even I filled labor complaint on Employer “A”, and the investigator approached USCIS too regarding my labor complaint. Labor Iinformed that this is not going to impact on Visa stamping. Even I am. Bit nervous. Since five months I didn’t got any updates from consulate. (Default reply @ support). So what could be reason behind this delay? Is there any possibility to change employer now to C.? Do you have any update about your case? I almost on same boat. Did u get any reply from embassy? I attended visa interview on 16th of November got 221g white slip ,after a week got a call and was asked for supporting documents to hydfpu@state.gov . I have not get any reply back not even automated message , I am worrying now about documents received or not .Resent the documents again today. Did any one got reply after submitting the documents to hydfpu@state.gov ? . I am an international student on f1 visa in USA. I transferred my university legally due to financial issue of my parents. All my sevis information is clear and I have always been in valid status. Recently I got H1b approval to USCIS and came to my home country for visa stamping. But VISA officer was concerned about my reason of univoeristy transfer and gave me yellow slip 221g. It has been more than 50 days and I was not asked my document and my status is not updating on ceac website. I want to know the reason of such delay as I have my record clear. Did your visa get issued? I am F1-renewal visa applicant currently on OPT.I gave my visa interview on 07dec2017 and got 221G for additional documents at Delhi consulate.I submitted documents on 09dec2017.I asked for the status of my case on 08Jan2018 and got the same generic response.I was asked to submit additional documents on 10Jan2018 (don’t know if me inquiring about the status of my case could have triggered this or this was needed). I submitted documents on 10Jan2018 itself. Although my case last updated on CEAC website shows that it was last updated on 07dec2017 (interview day).Could you please guide me as to how much more time this process would take? Also, the docs asked later were not mentioned on 221G slip before. Any guidance on your part would be highly appreciated. Could you also guide as to how F1-renewal cases on OPT are handled differently than H1 or other cases? I am currently in administrative processing for the last 150 days. I am from Ireland and was applying for a H1-B renewal. I am fortunate enough to be able to work remotely. My question is, can I claim all the tax back that I have been paying since living back in Ireland. Does anyone have any experience with this? I would appreciate any information,thank you for this report. I’m done with my Interview last Feb. 1 all my documents leave at the embassy..
Feb.7 I already send the embassy what they needed. How long does it take for them to review my case. 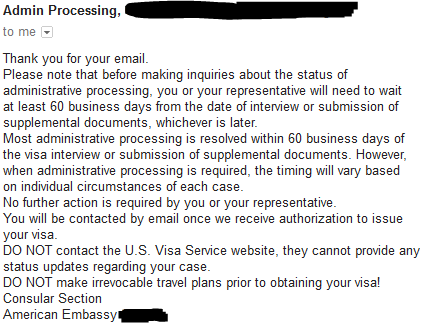 Im just wondering how long does it take for them (US Embassy Manila) to review my case and got my Visa Approve. In interview time say consular me ur interview ok.. give me blue slip 221g and say me joint sponsor papers and passport drop off box and i sent all document and passport send first in my case status show administrative processing but now show ready for interview and me too much confuse and i give already interview ….now can me please tell what i do ??? My husband already had his interview in Jan 2018 in Nicaragua. They wanted some additional documents. Which was turned in about a week later. Then they wanted more which we turned in. The date that we turned in the last of the document request was Feb 8. After emailing them they said it would take up to 60 days for any changes. I emailed again to make sure they had received all the documents they had requested. They sent a responding email saying this: “You will receive an email between 2-3 business days with the instructions to follow “. So what would that mean?? So the email that we received was nothing! No changes! It still says “READY” even though they said there will be instructions to follow. Only thing that updated was the date!! I don’t understand why the case wasn’t really updated! The last time I called they said they don’t take phone calls…. didn’t understand that when there’s a phone number for you/me to call. Actually our Lawyer is drafting up an email to send hopefully today or tomorrow. I hope we get answers soon being that 60 days will be coming up on May 8th. Thanks for the info. I work for an employer and my client is Deloitte and we do project for North Dakota state. In the interview officer asked who my client is I said deloitte he did not agreed and gave me 221g to submit client letter from state of north dakota. As north dakota is not my client deloitee gave an client agreement letter between deloitte and state than I was asked to submit work order. Deloitte is not ready to give that to us but they agreed if they get request from consulate they will send them. I sent mail to consulate requesting them to request document from deloitte and communication from them since. do they send such kind of request? I’m trying hard to convience deloitte to send that document directly consulate refering my case num. Can some one let me know will consualate send mail to deloitee requesting document? My parents had gone for B1 visa interview at HYDERABAD INDIA US consulate. My mother got the visa however my fathers visa status was under administrative processing now its been more the 6 months there is no update, If we send them an email there is an template they reply back stating status is under administrative processing as soon as its done we will contact you. How do i check whats the latest progress last updated shows 25th September 2017. Did your father get the visa? Can they consider the case again passport already they have they didn’t give me passport till now??? Hi there, very good information. My case is B1/B2. 221g white slip. Application Submitted 29oct18 and interview same time. Been to USA more then 10 times on same kind of visa… you have mentioned mostly about H1 visa. HI I am Submitted the documents which consulate has requested for through my company email and i didnt receive any email from the embassy as suggested above. Does this mean documents never made it to consular. Do i need to send them through my gmail. Please suggest. I work in Atlanta with valid work permit (H1B). I’ve applied H4 dependent visa for my wife in Nov-2018 (Chennai) and the interviewer said visa is approved. But after 5 days she got an email stating the case has been moved to administrative processing under section 221g requesting for a questionnaire. We’ve submitted requested documents and waiting for a reply from USCIS. It has been more than 90 days but still no response from them. Raising a query against USCIS is not yielding much info. Anyone has a similar experience of getting 221g on a dependent visa? Pls share. We’re losing patience by waiting for a response from USCIS.